Back in 2008, I worked as an associate literary agent for Irene Webb. It was my dream job: read books and get PAID to do so. I mean, that’s so much fun. What wasn’t so much fun? Navigating the wonky aspects of the publishing world. How to get a new author noticed? One of the best ways was a strong Kirkus review. I like being liked. Feels nice. But more than a positive critique, I hope you, my readers, enjoy this new installment straight outta Alexa Padgett’s quirky mind. P.S. 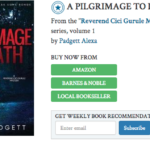 A PIlgrimage to Death is now available on all platform in paperback. It’s a really pretty book, y’all. I hope you pick up a copy.